From interactions with firefighters, WPI researchers discovered that stress-related heart attacks are the leading cause of firefighter fatalities. 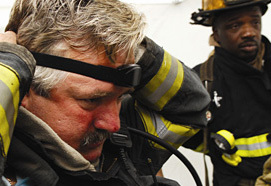 In response, they added technology to their location system that can monitor a firefighter's vital signs and alert incident commanders when firefighters are in distress—especially when their stress levels put them at risk of a heart attack. This integration includes a wireless, wearable pulse oximeter developed by Jim Duckworth, associate professor in the Electrical and Computer Engineering Department, and Yitzhak Mendelson, associate professor and interim head of the Department of Biomedical Engineering. Their work was funded by a major award from the Federal Emergency Management Agency (FEMA).